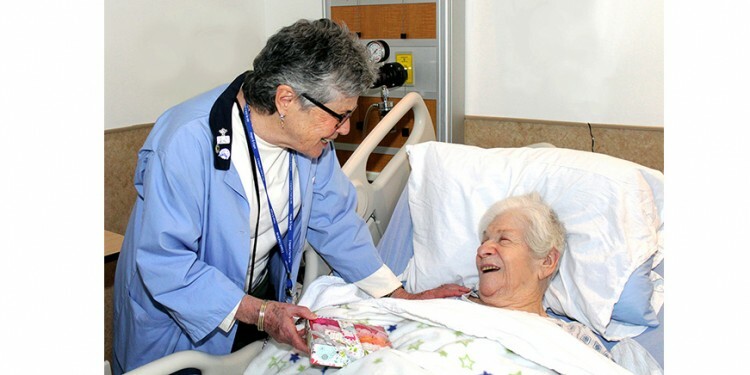 Jeannette Singerman, a volunteer in Palliative Care, shows a package of rose-shaped soaps to patient Leah Pasechnick, who chose to present them as a gift to a loved one. “Aren’t these beautiful?” Jeannette Singerman quietly asks, holding out a box filled with handcrafted, rose-shaped soaps. “They sure are,” replies Leah Pasechnick, an elderly JGH patient in a Palliative Care bed. With a wide smile, she grazes her hand over the clear plastic top of the box in Ms. Singerman’s hands. Palliative Care volunteers Roz Brawer (left) and Jeannette Singerman (right), accompanied by Rifka Hanfling, a Palliative Care Coordinator, visit patients on the unit with a cart full of donated gifts. 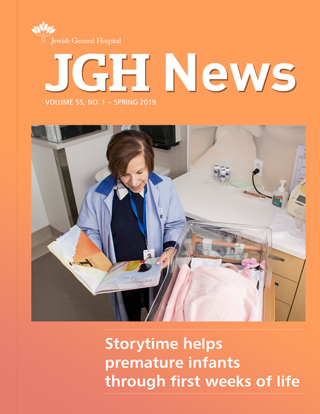 The gesture may seem small and simple, but it holds deep meaning for patients to whom much is given, but who themselves have a limited ability to give. That’s why, during the most recent holiday season, volunteers like Ms. Singerman spent much of their time providing patients in Palliative Care with an opportunity to be gift givers, perhaps for the last time in their lives. Launched by Hope & Cope in 2011, the Gift Giving Program usually gets under way in November, when new gifts (all of them donated) are collected and stored on a trolley. From December 1 until New Year’s Day, the volunteers visit patients and help them choose a few items, which are then wrapped and labeled by the volunteer for later presentation to the patients’ loved ones. If the patients are capable, they give the gifts to their loved ones themselves; otherwise, the volunteer does so. Among the most commonly donated items are toys, toiletries, kitchen items and candles. This past December, there was also a selection of children’s books, ties and knitted scarves and mittens. Loved ones who receive gifts often pay it forward by donating gifts for the following year, or simply by donating funds to the program, says Ms. Hanfling. 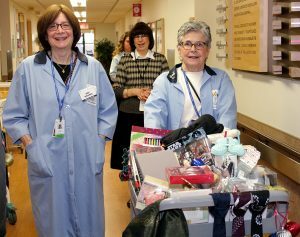 Patients tend to express their appreciation in a different way—often non-verbally, through their broad smiles—when they see the gift cart. And when they choose the wrapping paper, their eyes light up. “It really gives them a sense of worth and purpose,” says Ms. Hanfling. For all of the 30 volunteers who participate in the program, it’s an equally emotional and rewarding experience. “What I get from the patient in return is so huge,” says Ms. Singerman, who’s been volunteering on the unit for 10 years. Year round, Hope & Cope offers gifts to patients—from fluffy teddy bears to socks and blankets—to make them as comfortable as possible during their stay. Trained volunteers also offer massages to patients on a weekly basis.